Growing plants from seeds is one of the most rewarding undertakings to be had by gardeners of any persuasion. Growing seeds of one species, when obtained from various sources (differing in provenance), can be particularly intriguing in light of the natural variation that exists in many species. A couple years back I put a out a request for seeds of Lilium catesbaei. Through the generosity of the few that read my blog, and that of newfound friends, I was able to obtain, germinate, and grow seeds of various collections of L. catesbaei from throughout the species range. While this species is known to be variable in coloration and petal width, there was one seedling that blew away all of my expectations. What do you think? I had to do a double take when this flower opened. While this was unexpected, it was not unprecedented. 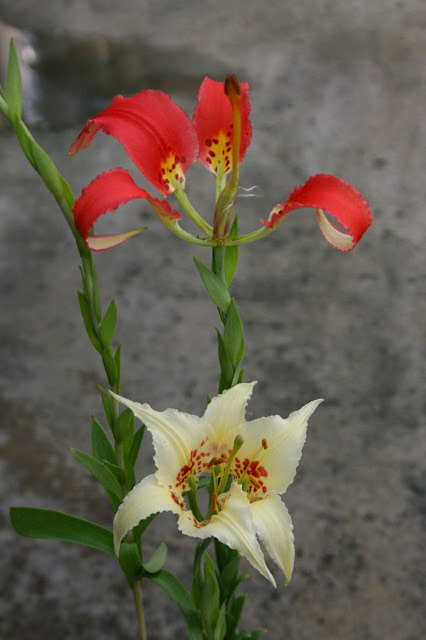 There is a photo of a similar plant on the website of the Pacific Bulb Society that shows a similarly colored plant that originated in the Florida panhandle (http://www.pacificbulbsociety.org/pbswiki/index.php/NorthAmericanLilium#catesbaei). 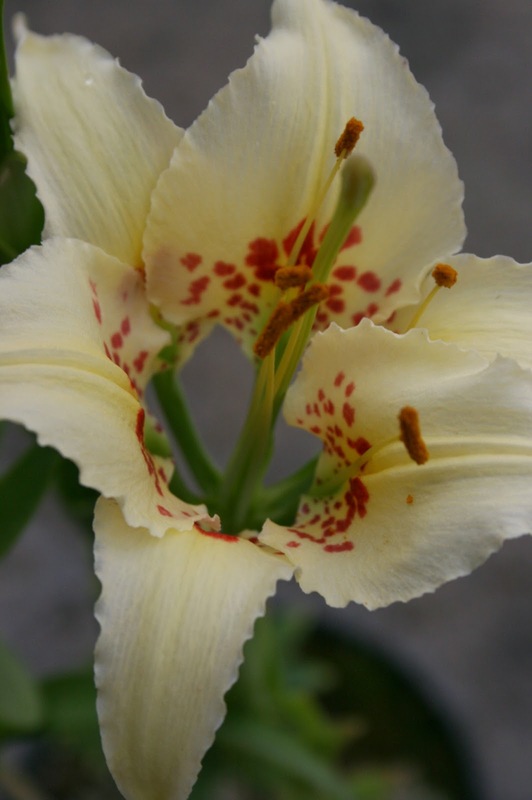 While the Florida plant is quite showy and similar, it differs from my seedling in that the petals are more narrow, and there is a complete absence of spotting. Whatever the differences are, they are both exciting plants and are monumentally rare, as is any form of L. catesbaei, in collections. One more photo comparing a typical L. catesbaei and the aberrant cream-colored seedling. There is one slight "problem" with Lilium catesbaei. Based on my experience with the species, it appears to be monocarpic. So, in order to maintain such variations, it will need to be periodically regenerated from seeds. Unfortunately, this was the only such seedling to appear in this batch of seedlings, so the only plant with which it could be crossed was a typical orange flowered plant from the same seed batch. Fingers crossed. Hopefully this proves to be a heritable trait and the next batch of seedlings will yield many more of these beautiful variants. Yes, it is technically still spring by the Gregorian calendar, but if you go by a phenological calendar, it is definitely feeling like summer in C-bus. Since I never got around to it in May (or April) and since the last flower of these just faded and collapsed in the last couple days, I thought it would be fitting to dedicate a blogpost as a send-off to the Cypripediums. After the heat and drought of last year, I'm surprised that so many of these lived. The first Cypripedium to flower for me was the primary hybrid Aki Pastel. Truth be told I find these plants underwhelming. I can appreciate them because of their large flowers and vigor and persistence in the garden, but the color pattern does not, in the clones that I grow, tend towards the pure white color of other "pastel" variants in other crosses. Two clones flowered in early May. I like the spreading nature of the lateral petals in the first clone. In contrast here is Cypripedium Michael Pastel flowering for the first time. This is an excellent plant! So far it has the purest white flowers of any "Pastel" variants to flower. Its amazing to me that a hybrid with such difficult to grow parents is so easy to grow. Cypripedium Inge has taken several years to establish but has finally flowered for the first time. I quite like this hybrid and hope it continues to develop and add more stems. 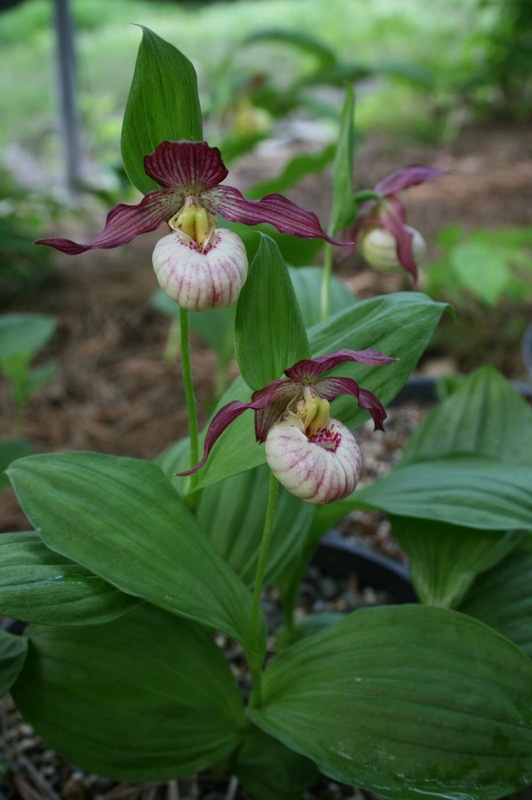 A plant that has been in my collection for a long time is Cypripedium Maria. I started about 10 years ago with some seedlings from Germany, and only a couple of clones are left, but the plants are indestructible and increase in size and flower every year. The flowers have the sweet fragrance of the Cypripedium parviflorum parent. Cypripedium Sam Saulys is a cross of Cypripedium Gisela x Cypripedium xandrewsii from Gardens at Post Hill. So far this plant has great vigor, large flowers, and good coloration. 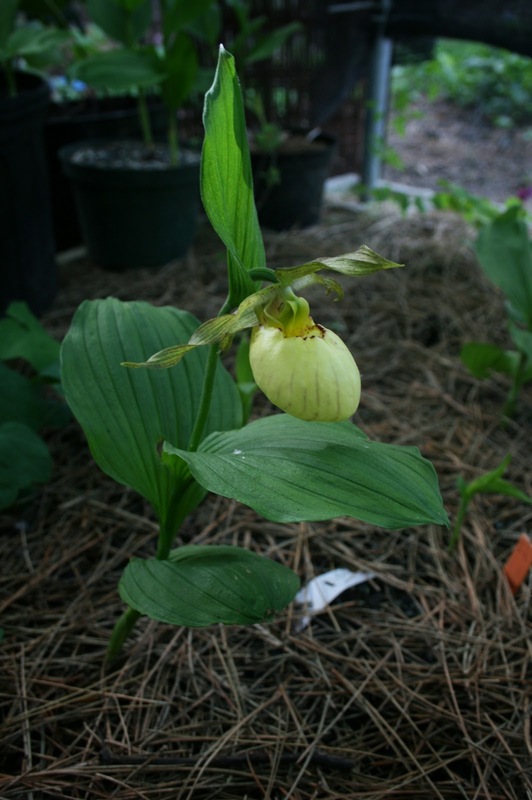 Last but not least is my favorite of them all -- Cypripedium kentuckiense. These are a couple of several year old seedlings from Spangle Creek Labs. These are two of my favorite clones. I always feel like I missed spring (and blogging during the spring). So much is going on that it is hard to live in the moment and before you know it, the heat has picked up, the rain has tapered off, and the soil hardens and cracks -- tell tale signs that summer has arrived in the midwest. As the transition to summer takes place, spring ephemerals quickly retreat and await next season for the their flash of magnificence. Any way, now that the summer flowers are starting to take hold, I thought I would share a few more Trillium photos and start thinking about next spring. Here is a form of Trillium stamineum with good, darkly mottled foliage that was selected by Nearly Native Nursery. I have only had it a couple of years, but can already tell it's going to be a good clumper (like other stamineum). This is truly one of the most distinct and easily identified Trilliums and one that people immediately flock to when they see it. It is very hardy here and in the Midwest is one of the best garden plants in the genus. I would absolutely love to find ( or trade for) a yellow flowered form of this! Below is another clone of T. stamineum that was given to me by a friend just this spring. This clone as collected by Fred Case and was considered by him to be one of the best forms of this species. The clump my plants were divided from was well over 100 stems. Very excited about this one! Speaking of Fred Case plants, below is another one given directly to me by Fred himself and a plant I had long been interested in. Supposedly this is a naturally occurring hybrid: Trillium decipiens x Trillium underwoodii. As mentioned in his book and extolled by Fred himself, this was one of the few forms from the T. decipiens/underwoodii complex that was cold hardy in Saginaw, MI. This plant came directly from the Case garden where it was growing in heavy shade in a protected site. It has grown very well for since that time in a container. A first time flowering Trillium for me this year is the rare and often confused Trillium viride. These plants were given to me by a friend in Illinois that collected them near Beardstown, Illinois. Apparently this population has suffered mightily and is in decline. These plants, after growing in my garden for two years, have substantially increased in size and vigor and appears well-adapted to my conditions. The first picture shows the flower the day it opened and the second a few days later. Trillium sessile is one of the most common Trillium species in the Columbus, Ohio region. Most populations have flowers that are maroon-red in color. In some populations there can be some striking flower color breaks that make for quite nice garden specimens. Here are a few of the best from this year. I purchased this plant last year from Broken Silo Nursery in Michigan as Callianthemum sp. Serowitz. This is likely to be Callianthemum anemonoides. Whatever the name this thing is cool and also the first time I have been successfully able to grow any Callianthemum. Despite their affinity for mountainous regions, this species demands a moist, woodsy soil, and shuns the rocky, drier soils suited to many other alpines. Admittedly I have only grown this in a container, but even i last year's heat it just kept on growing. Outside I would plant this in a raised bed with moisture retentive soil and morning sun. Hopefully it is self fertile and there will be some seedlings to experiment with in the future. This is a group of plants I would like to try more of! To give and idea of size, this entire plant is growing in a 14 cm diameter container. The curiously swollen peduncle is interesting in it's own right. The label is about 10 cm in length. Just photos of this one. Too bad you can't smell it. It is faintly fragrant through the day, but becomes intoxicatingly fragrant at dusk. Note the double spur on each flower. This is a particularly large form of T. maculatum and one of my favorites. Not the greatest photo, but my hand gives some scale to the photo. This form of T. maculatum is about twice the size of other forms of the species I grow. Picture above and below is a more typical form of T. maculatum. The silvery leaves of these plants make the deep hues of the flower stand out. Like other sessile Trillium species, there can be much phenotypic variation between populations. Above is a subtly bicolored form of T. maculatum. This plant also has a particularly clear red flower color. Here is a form of Trillium underwoodii from the southern portion of the species range. Note the characteristic, particularly long flower petals. This is one of the earliest risers in my collection and can sometimes emerging stems can be found as early as Christmas. Another southern sessile Trillium species that I am becoming quite fond of is Trillium ludovicianum. This is a species of subtle beauty; I find that it is best appreciated up close and is particularly amenable to container cultivation. It is also relatively fast growing for a Trillium and readily forms clumps. I have not tried this outside but suspect it would perform well in a sheltered location. Do to the cold, prolonged winter (and spring) of 2013, most pedicellate trilliums are still emerging and nowhere close to flowering. There is one exception; this white Trillium erectum (looking very similar to T. simile) is very early to flower each year. Some of the best days are those in which a new seedling, species, etc. flowers, fruits, or does something unique for the first time. This has been happening quite a bit in my orchid collection over the past year, but now something new and different makes an appearance for the first time. I received seed of Iris atropurpurea x Iris haynei from SIGNA (Species Iris Group of North America) in early 2009. Only 2 of 5 seeds germinated and the seedlings are polar opposites. This pictured specimen is large and grows vigorously, while the other is more diminutive, slower growing, and yet to flower. Here are pictures taken in in more overcast conditions. This seems to highlight the somber coloring of the flowers.